Remove the gas and fumes from cutting your lawn with the Ryobi 48-Volt Riding Lawn Mower. 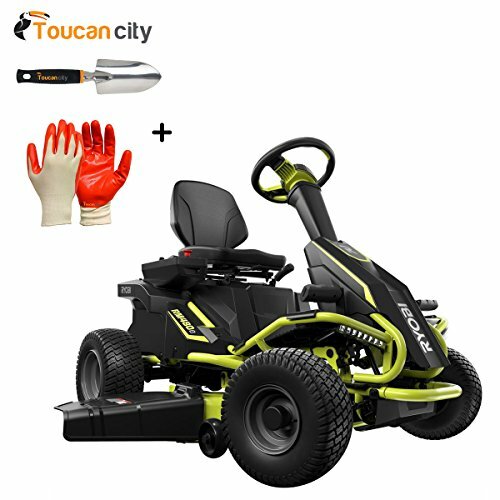 Powered by 75Ah Batteries and with 2 hours of run time this mower is a green alternative to traditional gas riding mowers. The Ryobi 48-Volt Riding Mower comes equipped with 38 in. 2-Blade Deck and 12 Position Manual Deck Adjustment to get a clean, level cut on your lawn. The Ryobi 48-Volt Riding Mower is equipped with LED Headlights, USB Phone Charger and Cruise Control features making mowing as efficient and convenient as possible. If you have any questions about this product by Toucan City, contact us by completing and submitting the form below. If you are looking for a specif part number, please include it with your message.